Remember the old 'Silent Movies' of the 1920s and 1930s? They were the good old days. Well, they are still here with us thanks to Concert Video Presentations. Films such as the spell-binding 1929 blockbuster, starring Lon Chaney, Phantom of the Opera; the epic 1928 film King of Kings telling the story of 'Christ' By Cecil B. DeMille; The Hunchback of Notre-Dame; Buster Keaton The General and, of course, the hilarious Charlie Chaplin short films can still be viewed today with organ accompaniment. 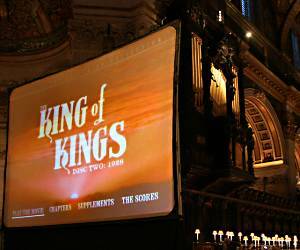 We have managed and run many silent film shows for the world class organ improviser, David Briggs, including the opening night of the St Albans International Organ Festival, 2005. David's phenomenal powers of improvisation conjure up the most marvellous of musical canvases, and audiences leave after the film with beaming faces and a feeling of sheer joy. "There's nothing quite like sitting in a dark cathedral, a huge screen at the front, surrounded by a unique gothic ambience, with moonlight filtering through the medieval glass and improvised music coming from a powerful cathedral organ. These 1920s silent movies are so deeply evocative of the age and the fusion of vision, sound and architecture can be an almost overwhelming experience. Keith Hearnshaw's Big Screen setups are second to none."